Can we acknowledge the new member here in the Philippines in ASR official website? I will send you the names of new members this week also I only consider member once the applicant acquired the ASR official patch, but if they just acquired the reflectorized vest only (our philippines vest with orange & white stripes) they are considered provisionary member for 6 months. if they failed to acquire the ASR patch within 6 months, their membership will be void and they need to pay the membership again. Awarding of Adviser Certificate to Rev Lorenzo Reyes. Optional for the previous batch released of R vest. 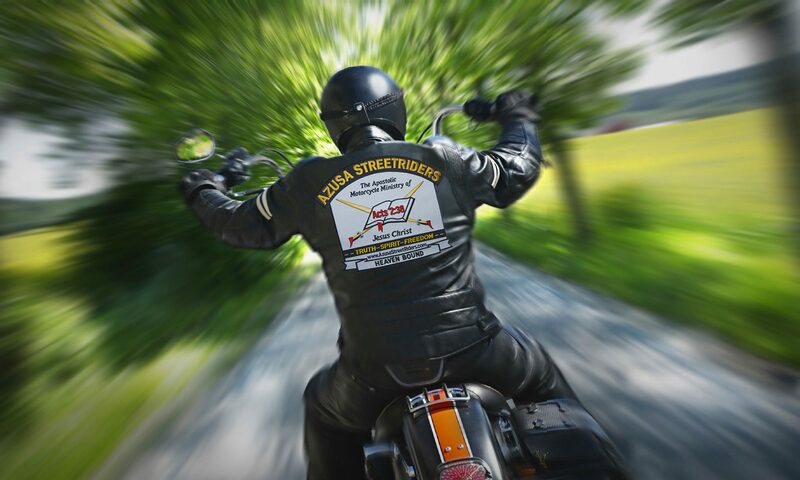 The Registration App for the 2019 National Rally is now available on the Azusa StreetRders Website under events. I will be posting in May’s edition of the Rumblings a detail outline of the schedule. Due to the success at our 2018 National Rally in Jefferson, Ohio compliments of Brother and Sister Theodore in regards to the lunch & Dinner arrangements, the Chapter in Maryville, TN would like to offer a “Meal Plan” at this years Rally. This meal plan would cover Thursday & Friday for both lunch (for those on the ride only) and dinner, immediately following service on both nights and will be held in the event center at FAC. I could go into more details of all the benefits of the meal plan however anyone who attended the 2018 National Rally knows how nice it was to walk from the service and have a nice hot meal ready and waiting. Unfortunately this year there will be a cost involved. For those who wish to “go out” you are certainly welcomed to do so there are many restaurants in the area however you would miss out on some of the best fellowship were going to have at this years National Rally. Registration Fee – covers the registration, 2019 event pin, Saturday Breakfast & Saturday Lunch. The Maryville chapter will host a meet & greet in the event center following Wednesday night service where pizza, salad, desserts and drinks will be served complements of this local chapter. I just wanted to take a moment and thank a couple of our brethren for jobs well done. Bro Theodore & Bro Joseph have over the years worked behind the scenes updating and maintaining this ministry’s public information flow. From monitoring both the Web Site and the various FB pages they have continually kept us informed and up to date with information relevant to ASR members and guests. In addition have kept inappropriate content from tarnishing our reputation. BroTheodore also contributes articles to our Rumblin’s every month and Bro Joseph works all the back office duties for our Web site. Thank you and God bless you and yours. 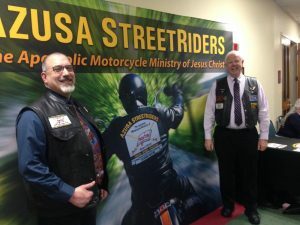 First off all of us should take a moment and thank the Lord for Brother & Sister Mcleod, Brother & Sister Perry and all of the members of the New Haven, CT Chapter for a Job well done presenting the Azusa StreetRiders Ministry at the WinterFire conference. Job Well Done! 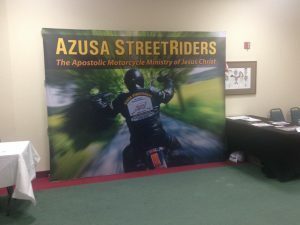 We, as Azusa StreetRiders, were privileged to have an opportunity to explain our Motorcycles for Missions Ministry to numerous Oneness people during the 3rd week of February. The venue was the major WinterFire Conference that occurs annually in the Hartford, CT area. It’s the premiere gathering of Apostolics for the Northeast Quadrant of North America. It was also the first time to utilize our new ASR display backdrop. People walking past us would literally stop and stare. It’s that effective! This would give us an opening to say something like “Do you ride?” And the conversation was off and running. I got to meet many of the New Haven, CT chapter members as we were on their home turf, so to speak. They’re to be commended for the ease with which they were able slide into biker related conversations. I’m convinced that these guys are on a 1st name basis with about half the population of New England! Hugs and “Biker Handshakes” were the order of the event. Chapter President, Jeff Banores, has some really good plans to promote the ASR message in his area. President Jeff now has the contact information for five prospective members. We probably wouldn’t have found these folks had it not been for our WinterFire participation. We’re looking forward to riding with any of the New Haven members who are planning to attend the National gathering this summer. Please allow me to share some insights gathered in Hartford. There are numerous District Conferences, Men’s Conferences, Youth Conferences, etc that fall under the umbrella of our various Oneness organizations. These events are where we will have an opportunity to meet prospective members and raise our profile. Our new “May I Pray for You” patch drew a lot of attention. People were asking us if we had any for sale. I was also asked if we had “bumper stickers” of the patch. – Good idea. The personal connection of the New Haven chapter members made a big difference at this conference. 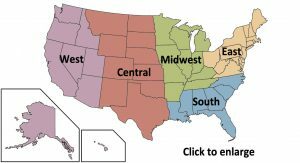 Chapter Presidents,,,, no one knows your area better than you……. Get out to your District events and see what will happen. We’re the largest “Oneness Apostolic Motorcycle Ministry” in the world. Let’s be scriptural. “Everyone Win One” would double our membership. It was an honour to represent our Ministry at this event. Both Brenda & I were ministered to by the anointed preaching The conference organizers did a great job on tis years ministers. Unless you’re somehow not subject to the laws of gravity, you likely feel a bit wobbly during slow-speed parking-lot maneuvers. This is because the stabilizing effect of inertia and the gyroscopic forces imparted by your bike’s wheels diminish as speed decreases, giving gravity the upper hand. Staying upright and balanced requires a deft orchestration of clutch, throttle, and brake, along with precise lean and steering angles, body positioning, and visual focus. Putting all these pieces together is challenging, but here are a few tips that will make slow-speed riding a little less nerve-racking. Since your bike is less stable at slow speeds, it’s important to maintain smooth, steady drive. A lot of bikes’ throttles are too sensitive for precise control at a walking pace, so it’s best to keep the throttle steady and instead use the clutch to control speed. This is called the friction zone. Locking the throttle by anchoring your thumb or index finger against the handlebar switch pod can be helpful. For even more exact control, drag the rear brake. Not only is it great for fine-tuning your speed, but it also has the beneficial effect of increasing stability by putting some tension in the drive train and rear suspension. The front brake on most bikes is quite powerful, and even a light pull on the lever is going to shift weight forward, compress the fork, steepen steering geometry, and upset the stability you’re working so hard to maintain. Reserve the front brake for stopping, not adjusting your speed. Now that you know how to preserve slow-speed stability, it’s time to make a tight turn. While it’s common to lean off the inside of the bike in faster corners, at slow speeds you’ll want to keep your body upright and let the motorcycle lean beneath you by shifting your weight to the outer edge of the seat, dirt-bike style. Keep your feet on the foot pegs to stabilize your body and so you can use the rear brake as needed to regulate your speed. Of course, if you mess up and need to put a foot down, do it. Yes, leaning a bike at slow speed is unnerving, but it is required. Remember that you can lean quite a bit without falling as long as you maintain enough momentum to counteract gravity. Being loose on the handlebars allows quick and fluid adjustments to maintain your balance, and remember to keep your eyes up, even if you get nervous. Slow-speed riding can be tricky, and it requires a specific set of skills. As always, practice makes perfect, so spend some time riding slowly to get used to slow-speed balance. Use the clutch, throttle, and rear brake technique to creep along slowly. You know you have good balance if you don’t need to saw the handlebars back and forth to stay on course. Now put all the pieces together to make slow U-turns. With a bit of courage and a lot of practice, you’ll be the master of your local parking lot.